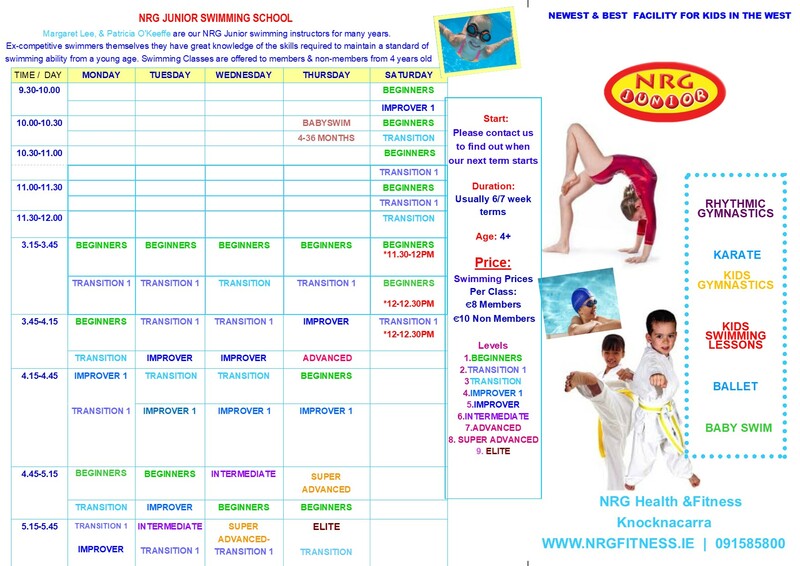 The below timetable is for NRG Knocknacarra starting on the week of February 25th 2019. 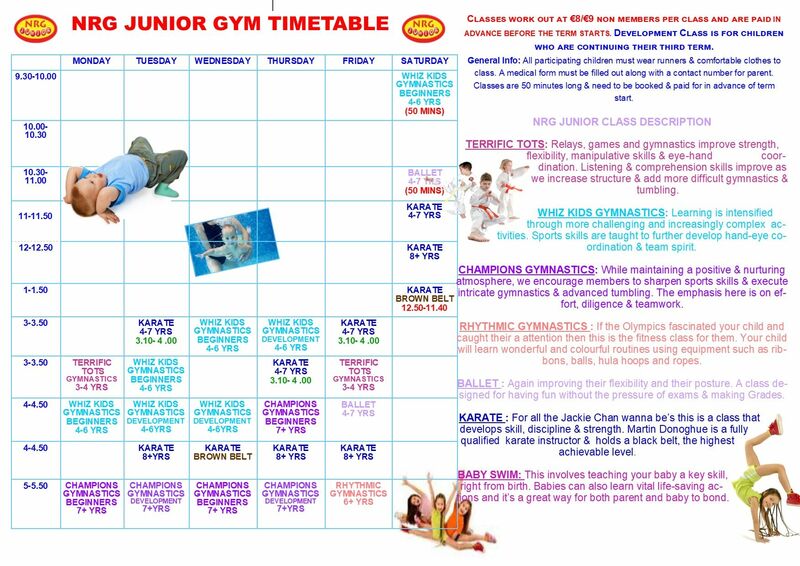 Kids classes that we run here in Galway are as follows: swimming, gymnastics, kids dance, ballet, toddler gymnastics (terrific tots), karate, teen xfit, baby swimming and much more! Scroll down for swim level description. Beginners – None to very little swim experience. Transition 1 – Face in water, ability to move arms & legs in water with float, ability to stay afloat by themselves in 4’8’’ water, body close to horizontal in water, no fear in deep water. If your child can’t do at least one of these, they are at the beginner level. Transition – Ability to use arms and legs. Unaided back and front for 10 metres. Improver 1 – Ability to swim 1 length back and front until knowledge of f/c breathing. Improver – As above with basic knowledge of breaststroke. Intermediate – Ability to swim minimum 1 length front crawl, back crawl and breast stroke with good front crawl breathing. Advanced – Competent in all 3 strokes. Being able to swim 4 lengths comfortably without stopping. Elite – Endurance stamina knowledge of all 4 strokes. Swim for half an hour continuously.